Another amazing story by J. S. Burke. Her stories are about compassion, friendship, dreaming big and striving to accomplish the improbable. In this book three golden dragons and two of their octopus friends embark on an adventure in search of the legendary ice dragons. I was particularly drawn to the new character, Drakor, in this second book of the series. Coming from a dictator led society, he’s introduced to the more open and cooperative society of the golden dragons and that of their octopus friends. He learns much and teaches much in return. The open cooperation of the gold dragons fits Drakor’s intelligent and kindhearted soul. Drakor is concerned for the safety of his people while the tribe’s leadership sees no threat. Risking his own life and personal standing within the tribe, Drakor does what he believes is necessary. With the help of his new friends, he makes a bold attempt to ensure his people survive global changes beginning to take place. 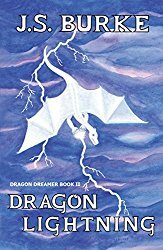 After reading through this second Dragon Dreamer book I am convinced that this author’s books would make a great addition to elementary school libraries and classrooms. There is so much education slipped into this fun, youthful, fantasy world. Science and exploration along with environmental issues, cultural diversity and acceptance, charity and generosity, political systems with different leadership structures engaging in cooperative trade agreements and treaties, etc… all in an enjoyable entertaining package of dragons and octopi, with a squid tossed in for good measure. The adventure is expertly penned and draws in even the mature reader. Burke has a talent for imparting solid moral and ethical values in a delightfully subtle way that would never offend anyone regardless of their beliefs. She skillfully promotes values common to all rational, thinking humans in a way that is almost not noticeable. The older reader recognizes the educational value and the children are introduced to valuable life lessons in a fantasy world full of intriguing adventure and interesting characters. This is a series that I want my grandchildren to read. So, I’ve bought both books in the series and when there are more in the future I’ll be buying those as well. It is my hope that others will want to read these wonderful children’s fantasy novels too. I’d recommend the series for 4th grade through middle school readers and as young as first or second grade to be read aloud. This entry was posted in Book Reviews and tagged #IndieBooksBeSeen., Book review, children's fantasy books, educational books, Fantasy, indie authors, reviewing books, supporting and Promoting self publishing Indie Authors. Bookmark the permalink. Thank you so much for sharing my Dragon Dreamer books on your wonderful blog! It is a pleasure to share such unique and wonderful fantasy for young people. Thank you for your writing.